Read biblically grounded and theologically informed reflections on various topics, all rooted in a confessionally Calvinistic commitment to Scripture. Here you will find a wide range of articles covering a number of topics and pertinent issues in our day. Access longer academic articles carefully researched to address the full range of theological disciplines, all from a Baptist and confessionally Calvinistic perspective. Add to your theological library with books consistent with the historic Calvinistic Baptist tradition that promote health and life in local churches. 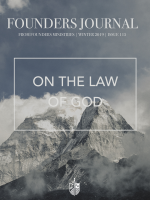 The Founders Press publishes books focusing on systematic, historical, pastoral and practical theology. Gain academic and pastoral training through our online academy. We pair you with a mentor as you think and work through what it means to labor in gospel ministry. Whether preparing for a first time position, or needing refreshment after years in ministry, our courses provide training rooted in the unchanging truth of the gospel. Search churches with a pastor subscribing to at least one of the following Baptist confessions of faith: the Abstract of Principles; 2nd London Baptist Confession; 1st London Baptist Confession; or the New Hampshire Confession. If you are looking for a minister for your church or your church is looking for a minister, please use our Minister Search list. Join us at an event in your area to be encouraged and equipped for the work of building up the church. Link arms with others as we gather to hear teaching, invest in relationships, and pray together.